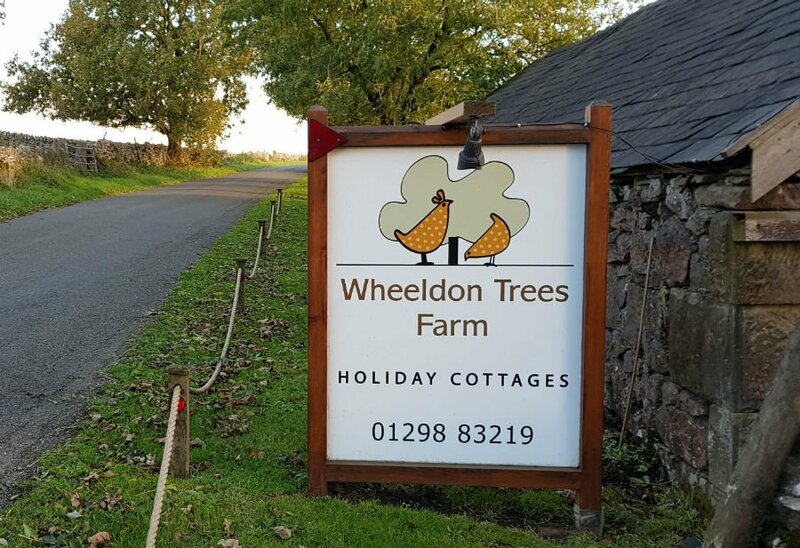 Wheeldon Trees Farm is a collection of 9 baby and toddler friendly holiday cottages in the Peak District. 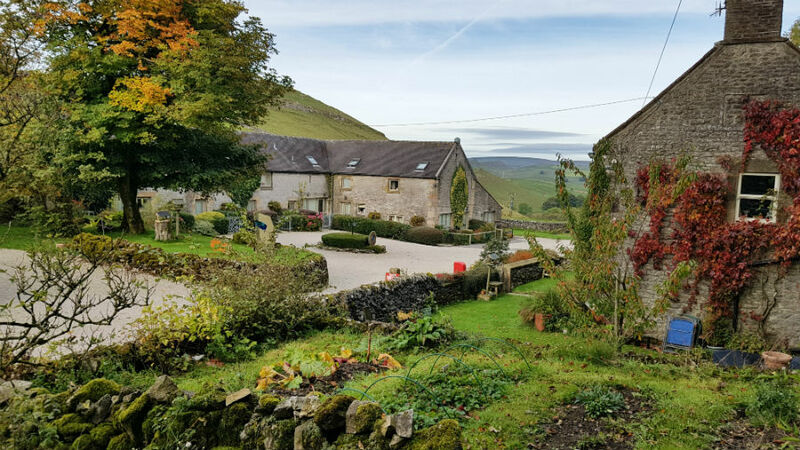 They have been converted from an 18th century dairy barn and sit within 12 acres of farmland, and have far reaching views over the Peak District. 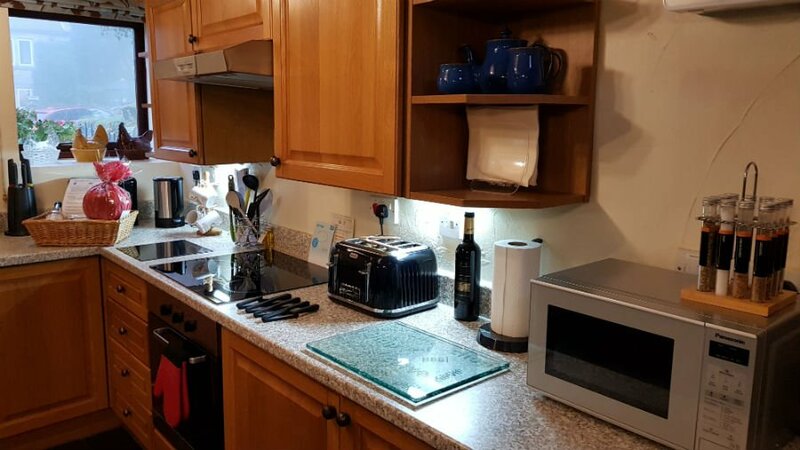 The cottages are in an ideal location to enjoy the magnificent Peak District with Buxton, Bakewell and Matlock being close by. Days out at Chatsworth, National Trust Ilam Park and even Alton Towers and Gullivers Kingdom are within easy reach too. And if you want to have a quiet day, there is loads to do onsite at the cottages themselves including daily animal feeding, an indoor playroom and a small adventure playground. 9 baby and toddler friendly cottages sleeping from 2 to 5 people. 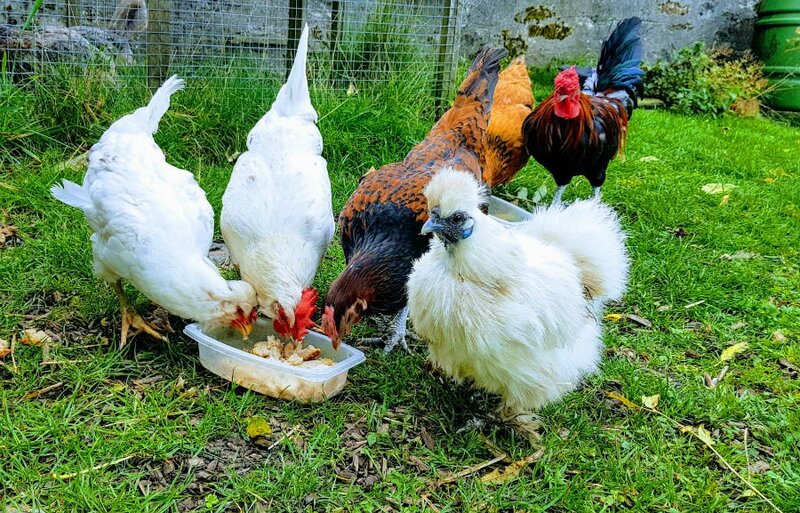 Daily animal feeding of the lambs, alpacas, chickens, ducks, rabbits and fish. Egg collecting too. Indoor Games Room packed full of books, DVDs and toys. Loads of baby and toddler equipment available to borrow. Flexible arrival days – you can arrive when you want. 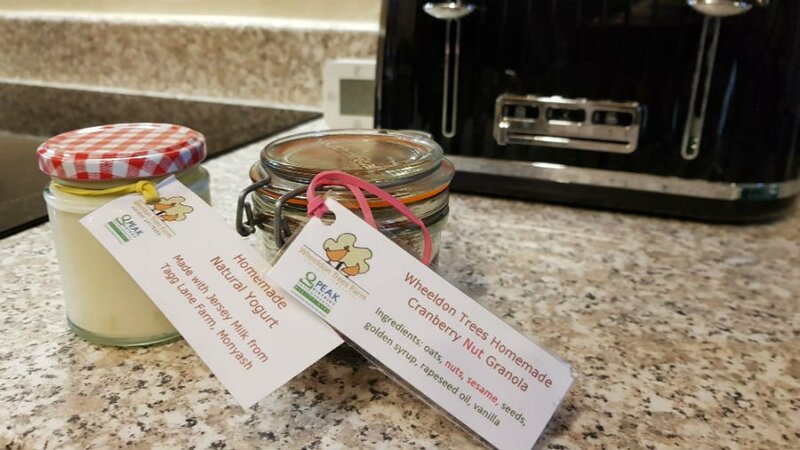 Homemade meals are available to purchase from the onsite store. 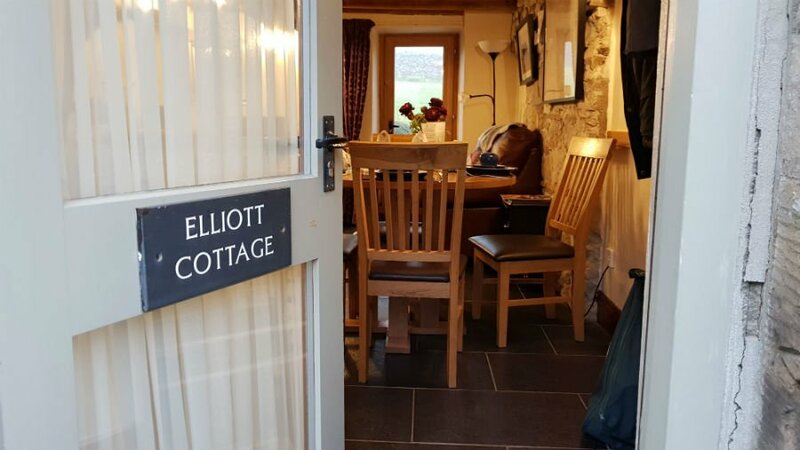 We stayed for a weekend at Elliott Cottage, which is a 2 bedroom cottage with a double bedroom and a twin bedroom upstairs. The stone cottages are built around a central courtyard, and all have their own private and enclosed gardens overlooking the mighty High Wheeldon peak at the back. They have loads of original features such as exposed beams and high ceilings, but also boast mod cons such as underfloor heating, an Amazon Echo and smart TV. The living area is open plan containing a modern kitchen complete with all the utensils a family could ever possibly need including a Nespresso coffee machine (and pods) and even a soda stream. Crockery and cutlery for toddlers is also provided. There are comfy settees with thick rugs draped over them, oak dining furniture and a dishwasher, microwave, oven and fridge freezer. 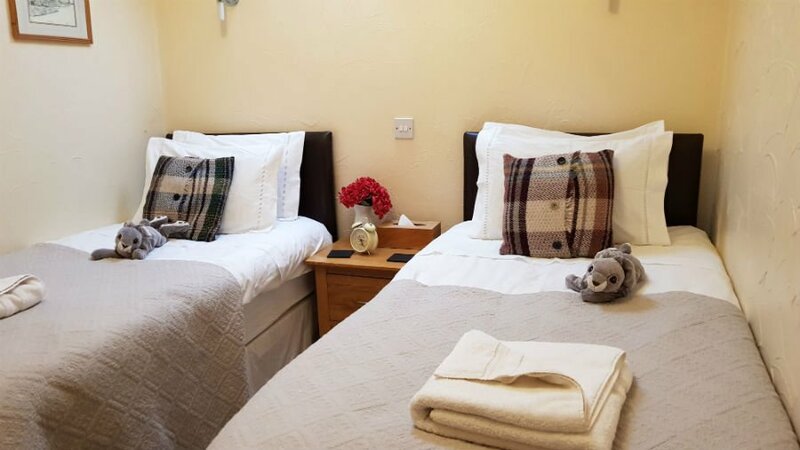 Upstairs there are 2 bedrooms with super comfy beds, high quality bedding and plenty of storage space. 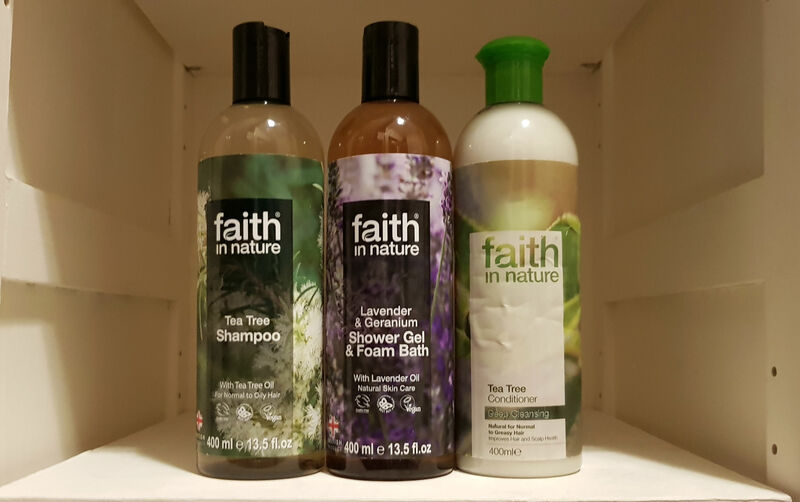 The fully tiled bathroom has a walk-in shower and complimentary toiletries. 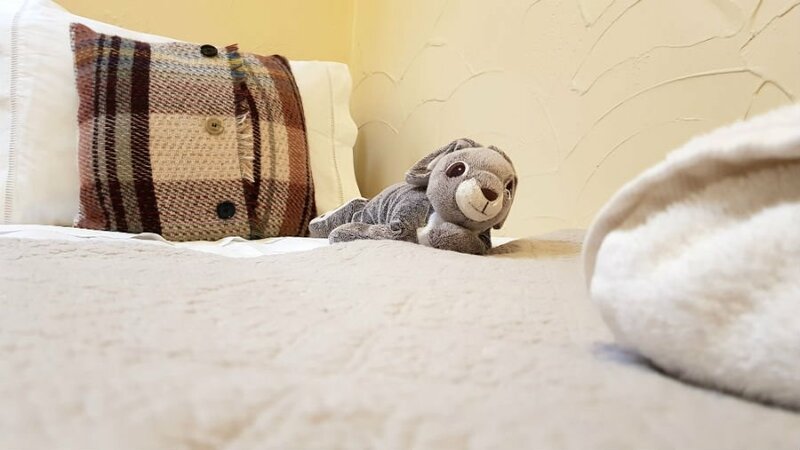 Little touches like hot water bottles and teddies on the beds make it even more special. 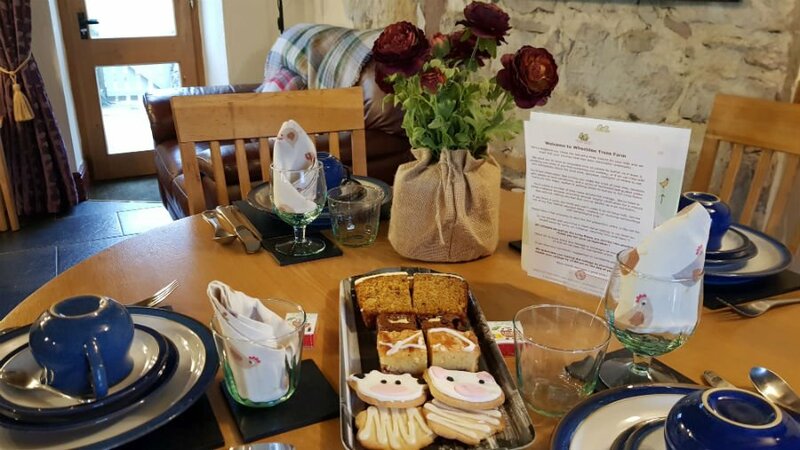 Upon arrival, the cottage was warm and toasty, classical music was playing in the background and the table was set with a large plate of locally made carrot cake, chocolate brownies and Bakewell Tart – the perfect way to start a holiday! 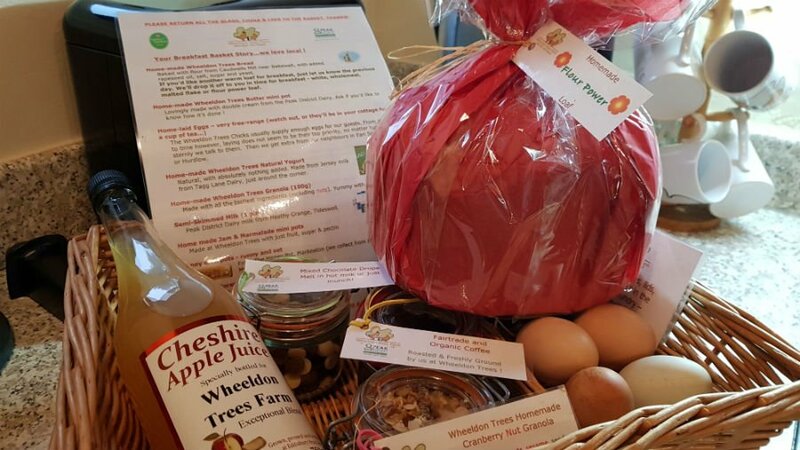 Another tip for getting a holiday at Wheeldon Trees Farm off to the best start, is to order a Breakfast Basket in advance of your arrival. 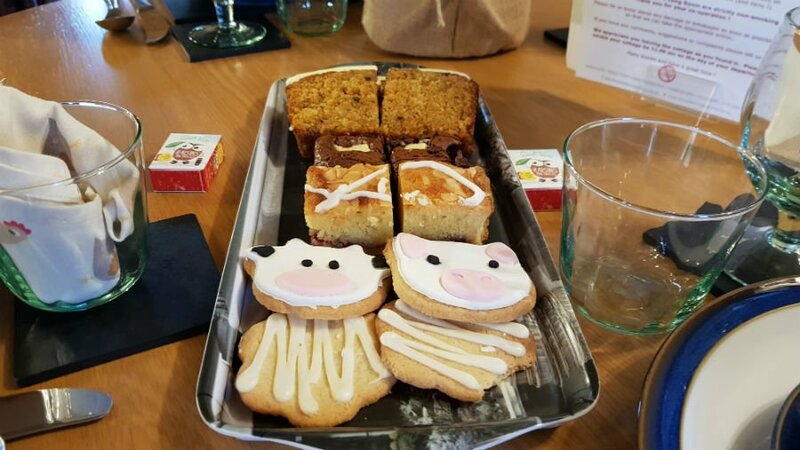 These consist of local Peak District produce and homemade goodies such as ground coffee roasted by Deborah and Martin the owners, Staffordshire oatcakes, Peakland white cheese, Cheshire apple juice, Derbyshire Dales organic sausages and bacon and homemade bread, granola, butter, natural yoghurt and jam and marmalade. There are even chocolate drops to melt into hot milk to make the best hot chocolate! If you run out of anything, there is a small shop onsite which sells all the essentials as well as homemade freezer meals. 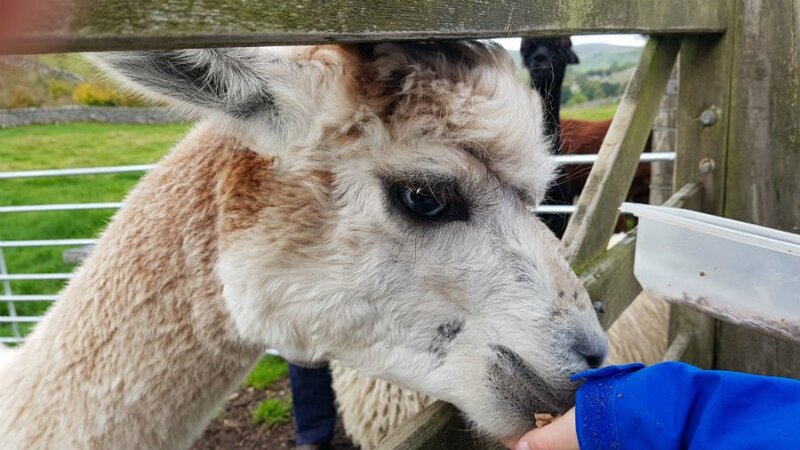 Wheeldon Trees Farm is home to 3 male alpacas, 2 sheep, a gaggle of hens and ducks, rabbits and fish. Mini farmers are invited to take part in the animal feeding which takes place daily at 9.30am. 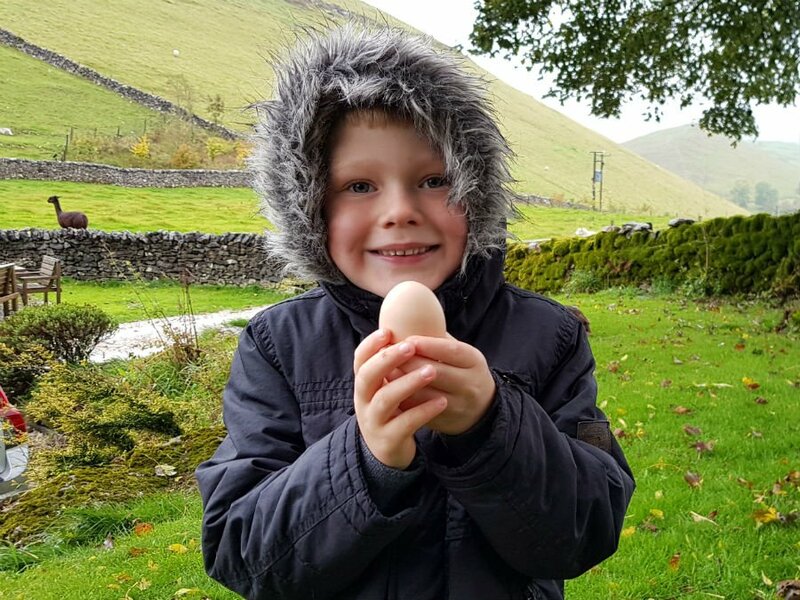 Children are given their own bowl so they can feed the animals themselves, and they can also have a look in the hen house to see if the hens have laid any eggs. The Long Room is an Aladdin’s cave for toddlers and children who will love playing with the many toys which Deborah and Martin have provided for families to use during their stay. Amongst other things there is a tea set, dressing up clothes, train set, Duplo, Lego, Little Tikes car, Tonka trucks, cars, a dolls house, books, games and jigsaws. 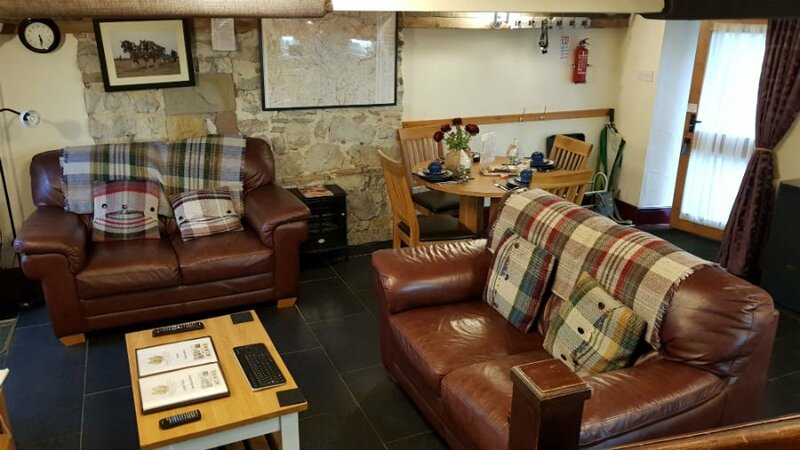 There is also WIFI, plenty of magazines, chairs and tea and coffee making facilities for adults. If the weather is bad, there is plenty in the Long Room to entertain little ones, but equally if the weather is good, children will want to go in there and have a play! Older children (parents?) will love the table tennis table and table football. There is a fenced off Children’s adventure play area with a rope bridge, baby swing, balance beam and much more. The best bit is the gypsy caravan which children can go and explore. For parents, there is plenty of seating plus stunning views over the valley. 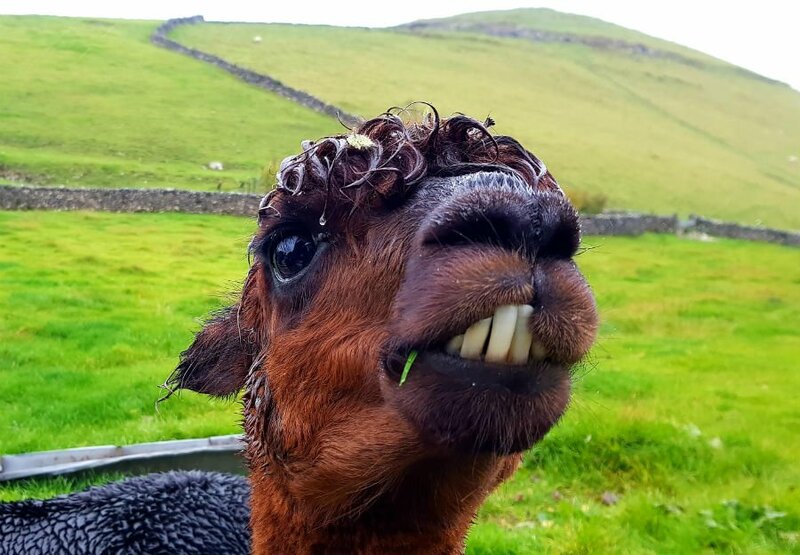 Chatsworth House – Don’t miss the Farmyard and Playground which has loads of opportunities to hold animals, learn about milking and some awesome sand and water based playgrounds. Plenty of Walks from the doorstep. We climbed High Wheeldon which is a hill overlooking the cottages. It’s a short, steep climb up (baby carriers essential – and there’s one available to borrow) but you are rewarded by 360 degree views of the Peak District when you get to the top. Ilam Park (National Trust) – Don’t miss playing pooh sticks from the bridge. Short stays and flexible arrival dates are available. 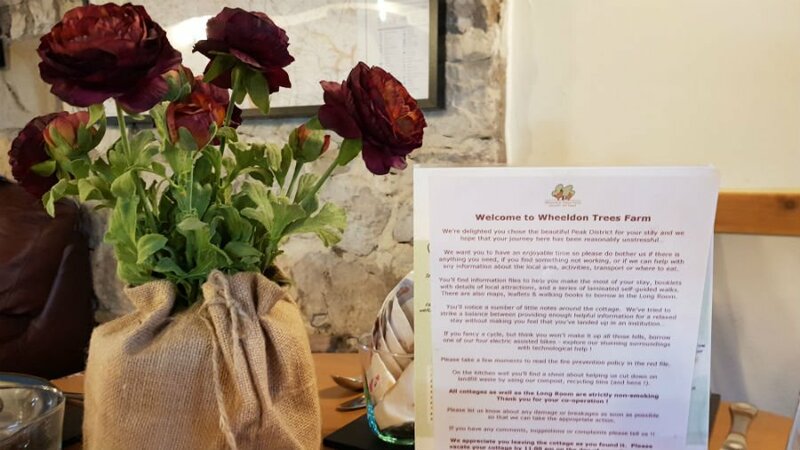 For an excellent family friendly place to eat, I’d heartily recommend the Royal Oak at Hurdlow – it’s just 5 mins drive from Wheeldon Trees Farm and the food is excellent. Children’s menus are provided. All stays include a Peak District Privilege card which includes discounts on local attractions. Oh these look totally up our street! Where do I start?! The location looks fantastic, I love that they all have a private garden, the family friendly special touches and the games room and of course the animals!